* To completely serve Trump, Walker gives Wisconsin business and jobs the boot. * Skyrocketing waterway pollution in a once-green clean state tell the story. * Why Walker is not the education Governor. * Why Walker is the pothole/Scotthole Governor, but not the transit Governor. * Walker was the highway deficit king even before he was Governor. * Insiders disclose the harm he's done to the formerly-credible, science-based DNR. * Walker's disregard of the state constitution's Public Trust Doctrine and related damage to Wisconsin's environment is ideological, intentional, extensive and perhaps irreversible. * Foxconn Fever - - fourteen months of Foxconn posts - - or how to give away a generation's worth of other people's money. * Walker is the special interest/public sphere-be-damned Governor; the Kohler golf course case study. * Dilettantism is a flaw, not a virtue. I love the pic of Scottie fishing. 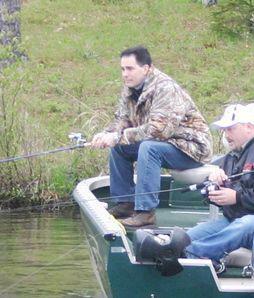 He's holding that spinning reel upside down and that seems emblematic of his approach to governance. Instead of serving the people he serves the elites and the corporations. The picture also is a perfect symbol of who his followers are from the mighty outdoorsmen group. A bunch of phony people who don't know the difference between a trout stream and a manure ditch.